The problem with playing catch-up with well-loved comic series is that you feel duty bound to try and slot everyting you read into some sort of linear timeline - and when it comes to Marvel Comics and series fragmentation, that's a purely impossible task. 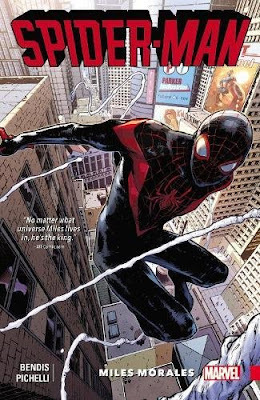 So our Comic of the Week this week, "Spider-Man: Miles Morales Volume 1" by Brian Michael Bendis and Sara Pichelli might now be two years old, and Bendis may have jumped ship to DC Comics from Marvel (lucky old DC, Bendis is an IMMENSE talent) but this series is undoubtedly one of the best if you've been looking for stuff that has interesting paralells that run comfortably alongside the behemoth "Into the Spider-Verse" movie. Miles Morales here is a bit older than he's depicted in the movie, with even more of the same issues he encountered in the flick. Being a teenager is hard enough. Being a teenager who also happens to be Spider-Man, has just been drafted into the Avengers AND has a Grandma who is convinced he's on drugs or running around with questionable young ladies is quite another matter entirely. So poor Miles. Alongside his long-suffering (but utterly brilliant, in our opinion) friend Ganke Lee, the dude's trying to cope with nefarious demons who want to turn the world to ashes, kicking the Avengers' collective asses in the process (thankfully Miles is around to add a little sting here or there to the invader) - but also trying to cope with plumetting school grades and a love life that careers from non-existent to completely disastrous. With the addition of a new pupil at his part-board school, Miles also has to deal with his secret identity accidentally being blurted out to "Golden Balls" - a mutant ex X-Men member who can summon golden spheres from...well, we never quite find out where from (thankfully). 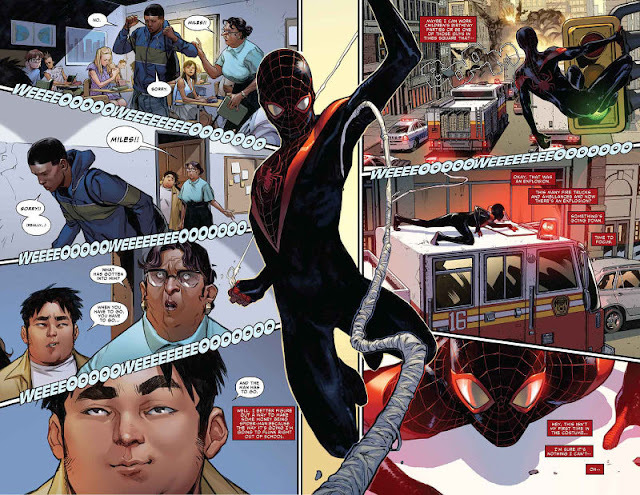 As the story begins to unfold at breakneck pace, Miles soon realises that a new super-criminal cadre would rather this new Spider-Man was hung up by his webs - permanently. Pichelli's artwork combined with Bendis' superb plotting, fantastic observational eye for teen angst - and a ton of tongue-in-cheek jokes, cameos and utterly KILLER lines, this is a total win of a comic. We've devoured Volumes 1 and 2 and are just waiting for Volume 3 to arrive so if you're on Team Miles and haven't read this yet, this is a truly awesome jumping-in point for more of his ace comic run. Sum this comic up in a sentence: It's not easy being Spidey!